The Yodock® 2001MB is a water-ballasted longitudinal channelizing device used for traffic control and construction projects. It can be used empty or ballasted with water, sand, or other materials. It can be interconnected or spaced apart to clearly delineate the intended path for motorists, pedestrians, and workers. The Model 2001MB is made from High Molecular Weight High-Density Plastic, which makes it 4-5 times stronger than other LLDPE plastic products. 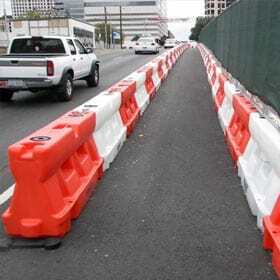 Temporary Barriers are available for rent from JTI on a weekly or monthly basis. The affordable rental rate includes delivery and pick-up at the end of your project. It doesn’t get any easier!